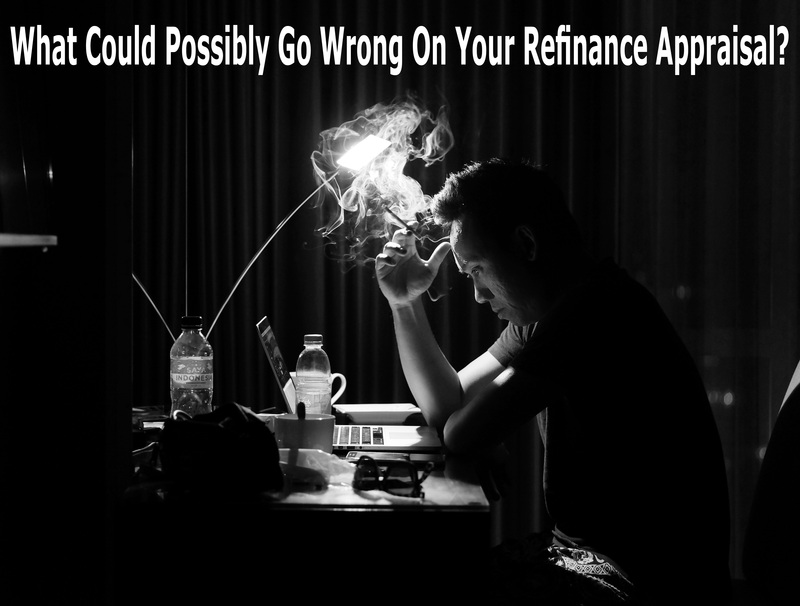 What Could Possibly Go Wrong On Your Refinance Appraisal? Did you know that the appraisal definition of a homes’ market value is the price a willing buyer and seller agree to on the open market? That’s exactly what happens when you buy a home – a willing buyer and seller have agreed to a price. But what’s the market value of a home if you’re refinancing and there’s no buyer and seller? Maybe you’re refinancing for a lower interest rate, called a ‘rate and term,’ or to borrow more money than the existing balance on your mortgage, called a ‘cash-out refinance.’ In either case, you may need a new appraisal. Since you’ve been through an appraisal before, you know what to expect from the process. In fact, you already have a good idea of what your home is worth based on sales in your neighborhood and improvements you’ve made. So you start the loan process, send in your documentation, pay the appraisal fee, and wait for the loan approval call. Except for the call you get from the lender isn’t about your loan approval. It’s about the appraised value, and it’s much lower than you expected. How can that be — do they have the right neighborhood and house? You are shocked and angry and want to know what went wrong and how to fix this. First, remember that there’s a lot less at stake now than when you purchased your home. There’s a reason your appraisal came back less than you expected. Your best next steps are to review the report with your loan officer to find out why. Look at the full appraisal and confirm that all the information is correct. There’s a lot of detail, so take your time and review it thoroughly. You might be the only one that can easily catch an error in the information on your home’s age, square footage, or improvements, for example. Next, review the other sales the appraiser has used to compare to your home, known as a ‘comparable.’ Look at the date the comparable sold, the room count, and square footage. Check if the comparable was remodeled, has a view, pool or attached garage. Note how these details, and any others you find in the report compare to your home. You’ll also see comparables included that are “actively listed” for sale. How does the list price compare to your homes’ appraised value, and how long has it been on the market? Check the map provided with the appraisal. It shows the location of your home and the comparables used in the appraisal. Are they a reasonable distance from your home or in similar neighborhoods nearby? Read the comments provided near the end of the report. This details why they used specifically these comparables and any other issues found in your home or your neighborhood. A common problem is additions or remodels done without a permit. Health and Safety issues noted in the appraisal. For a refinance, this could come up if a home is in the middle of a remodel when the appraisal is done. Some examples would include a non-working furnace, broken window(s), evidence of water leaks, missing flooring (with only sub-flooring visible), exposed wiring, plumbing issues, and a pool without fencing or water. Going through this analysis, and discussing specifics with your loan officer, will give you the best understanding of how the appraiser came up with the value. If there are errors or missing/better comparables, your loan officer can start a ‘rebuttal’ of the appraisal, also called a request for reconsideration of value (ROV). A formal rebuttal process officially challenges an appraisal, based on hard, documentable facts. Be prepared to help your loan officer gather corroborating information. Acceptable information includes addresses of recently sold homes in your neighborhood not already in the appraisal. They must have closed escrow, which is a completed sale, on or before the date of your appraisal. Or, you may need to obtain documentation from the county, including the actual square footage of your home, or copies of building permits. Researching these issues with the county can often uncover mistakes or delays in updating county records, It may take a little time and effort, but without actual documentation, the appraisal rebuttal won’t proceed. If Health and Safety issues are noted on the appraisal, discuss potential solutions with your loan officer. If the appraisal is valued ‘subject to’ those repairs being completed then a) you must do the repairs to get the loan approval, and b) they will not increase the appraised value when completed. The appraiser has already accounted for the completed repairs in the value. However, if the appraisal is done “as-is,” that means “just as it is.” The appraiser will consider whatever is there and the value will reflect the property in “as is” condition, with no repairs made. Other property concerns can impact the homes’ value. An example is a garage converted into a living area without a permit. A man cave is very cool, but without a permit, it looks like a garage to the appraiser. Many older homes have room additions completed without a permit long ago – a detail that can often be missed during an appraisal – until it’s not. If this occurs, your refinance appraisal will show that square footage subtracted from the total living area, reducing the value. Is all of this analysis necessary, or even worth it? Do you qualify for the loan amount you need with the appraisal value you received? The loan guideline for how much you can borrow as a percentage of the property value is called Loan-to-Value (LTV). 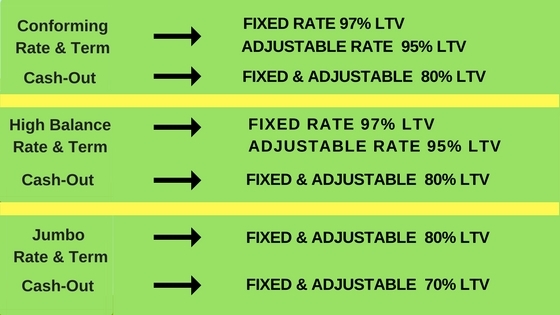 LTV is calculated by taking the loan amount and dividing it by the appraised value. Example: a loan amount of $250,000 on a home appraised at $345,000 is an LTV of 72.5%, and fits under a Rate and Term or a Cash-Out guideline. Note that the appraisal is for the benefit of the lender alone and not shared with any private or government entity. The value is for a single moment in time and is known only to you and the lender. Also, refinance values are often lower than you could expect to sell your home for in a normal market.